Local couples have always known that East Cooper is perfect for weddings, but it took Ryan Reynolds and Blake Lively to really put Mount Pleasant on the marital map. And no wonder – Mount Pleasant offers perfect venues and professional services.Boone Hall, of course, comes to mind first – and not just because of the recent celebrity ceremony. With a stunning avenue of oaks, a gracious mansion and beautifully landscaped grounds, Boone Hall evokes the classic Southern feel of times gone by. There is no better spot for a party than the Cotton Dock, spacious and versatile with expansive views of the marsh and Horlbeck Creek. Other venues include Alhambra Hall, a former ferry terminal turned event hall in the historic Old Village, and the elegant Cooper River Room in Mount Pleasant’s Waterfront Park. Both are great spaces for large groups and offer lovely water views. Although many couples still opt for large extravagant events, current trends favor smaller weddings that include just family and friends. These events are more intimate and meaningful for today’s couples. And elopements or spur-of-the-moment weddings are becoming more popular, spurring a new niche in weddings. Antonetti agreed that while budgets are shrinking, expectations remain high. 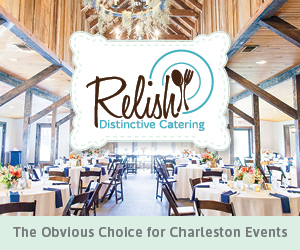 CJ’s offers catering on-site in private rooms at Gullah Cuisine or off-site in Mount Pleasant and beyond. The company works with couples to offer a high-quality event, including not only excellent food but also the extra details such as coordinating linens and dinnerware. Even cakes are being downsized, and it is becoming easier to find bakers who will create miniature versions. The Village Bakery offers custom wedding cake options in a variety of flavors and styles. Cupcake is also in the wedding market, with mega-cupcakes that are just right for a tiny group as well as regular and mini-cupcakes and cake pops. But no matter how fabulous the surroundings, the real star is the bride, and a lot of thought goes into selecting the dress. Here in the South, strapless dresses continue to be popular, but straps, raised bodice styles and, yes, even sleeves are showing up for spring weddings. “The brides today want to not only feel beautiful but also to feel comfortable,” said Terri Espy, owner of the Gown Boutique of Charleston, adding that brides choose dresses appropriate for their venue in light fabrics such as silk shantung, organza, tulle and chiffon. Espy said she and daughter Krista Roach “saw exciting lace types and styles” while on a buying trip to New York. Spring 2013 trends include accents such as black sashes and dresses that accentuate the back. Examples include “statement” bows, cutouts showing glimpses of the back and lace or beaded illusion bodices. Local brides love having one-of-a-kind gowns and lean to ivory, cream or champagne colors. Espy agreed that smaller, more intimate weddings are in vogue, saying that brides want to have fun at a well-planned event. Brides will purchase a well-made, quality gown and accessories and even change the look after the ceremony. Getting married in Mount Pleasant? It’s easy when you know the right people. 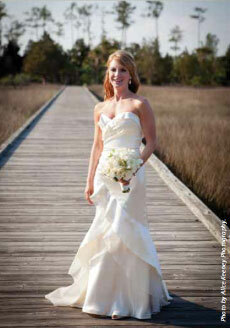 Barbara Millen Patrick offers wedding services through Elope to Charleston and writes for local publications.